Jypyä Pop (Turku, Finland) on 5 February 2019 in Lifestyle & Culture and Portfolio. @kiwisa: Maybe you are right. @Nina: You are very right. cats like walks on a leash. @yoshimiparis: I wouldn't let Leevi go out without a strap. There are many dangers for a lonely cat outdoors. Great contrast between cats and cold snow. Not only in colors. Cute shot! wow..standing in front of a snow hill!!!! Brrrrrrrrrrrrrrr ... I am feeling coooooooooooold here !!! In Japan, people say a dog likes snow, but a cat likes more warm place. Leevi is a dog ? @Hiro: Leevi sometimes wants to go out and we're out for a short time at a time. Inside, Leevi is looking for a warm place to get food first. Beautiful on the snow ! 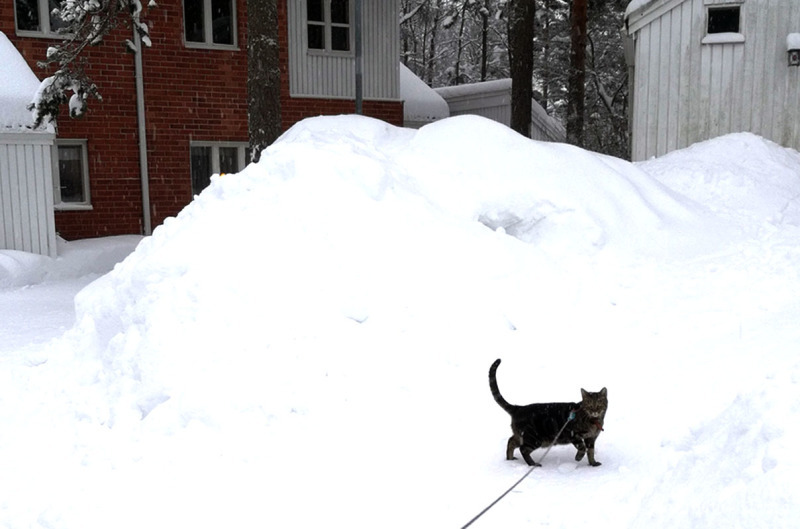 Quite a mound of snow that Leevi is ready to scale! le coquin toujours en piste... de sky. Leevi is pushing ahead in the big snow. He is so handsome and brave. @Ruthiebear: Thank you. I tell that to Leevi. He is happy. He does not seem to have cold. @tataray: Leevi is very happy even in winter. Not to be too long and when you get inside, there is always a tough hunger. Leevi is a hero in the snow. You can give him a hug. Ah, Leevi, Happy Silly Tuesday to you too! @B. Thomas: Thank You B.
J'aime le petit mouvement de la patte pour secouer la neige !